St George's Church at Brailes, 15 miles South-East of Stratford, is one of the largest and most impressive churches to be found in a village. The church site was used in Saxon times, and the existing building is early 14th century. The size of St George's Church is explained by the history of the village. In medieval times Brailes was an important town in Warwickshire, ranking along with Warwick and Coventry. The splendour of the church is evidence of the wealth generated by the wool trade in this part of the county. The feeling in this church is one of oppulence. 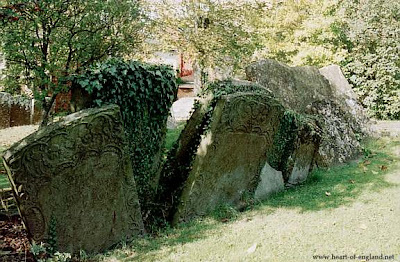 Massive tombstones, which have sunken into the ground over the centuries, in the churchyard of St George's Church at Brailes. 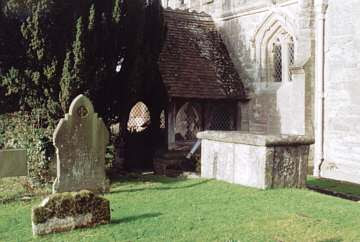 Old tombstones, old yew trees, and old pines in the churchyard of St John the Baptist at Aston Cantlow. 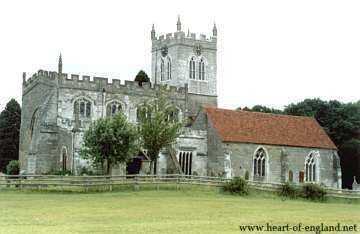 This is the church in which Shakespeare's parents, John Shakespeare and Mary Arden, are believed to have been married. The interior of the church is shown in the picture just below. The Church of St John The Baptist at Berkswell, is one of the finest examples of Norman and Early English architecture in the Midlands. 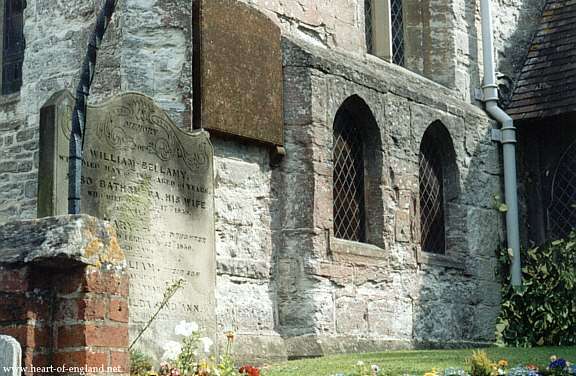 The earliest parts of the present church date from the 12th century, and it is likely that this had been a place of worship for some centuries before that. 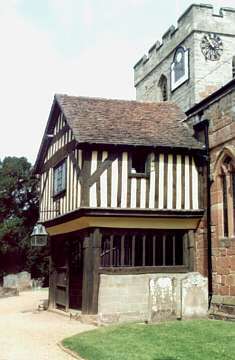 The half-timbered vestry above the entrance porch, shown here, has been used since at least 1611. The little upstairs room was originally the village school. Inside Berkswell Church the massive stonework, and polished dark wood, are particularly prominent. They give this church a feeling of strength and gravitas. 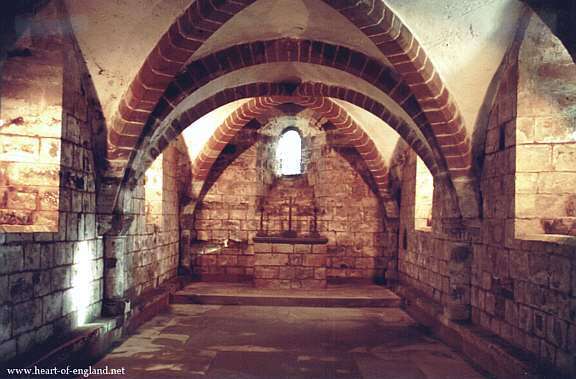 Beneath Berkswell Church is this crypt with some Saxon stonework, one of the best preserved in England. This may have been used as a shrine for sacred relics. The Church of St Mary at Astley, 5 miles North-East of Meriden, is the remains of an enormous collegiate church. 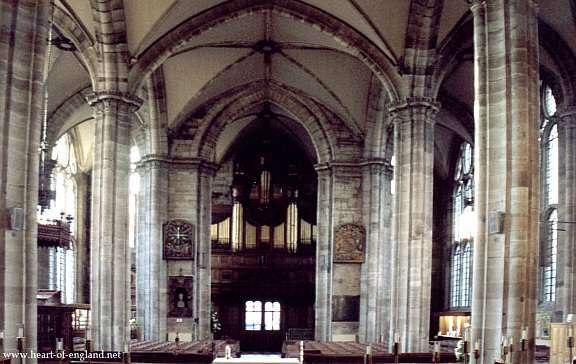 The collegiate church was established in 1343, but after the dissolution in the 1540's fell into disrepair and part collapsed. 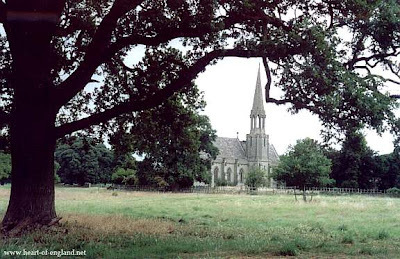 The church originally extended from the building shown here, to as far as the cottages visible in the distance. 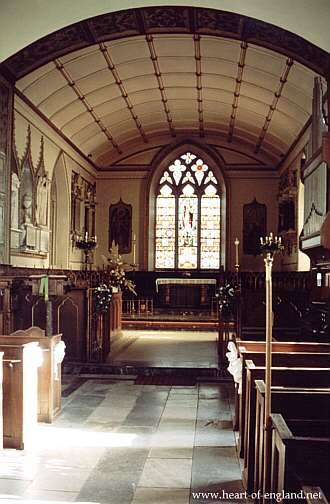 The nave of the present church was just the chancel of the original. 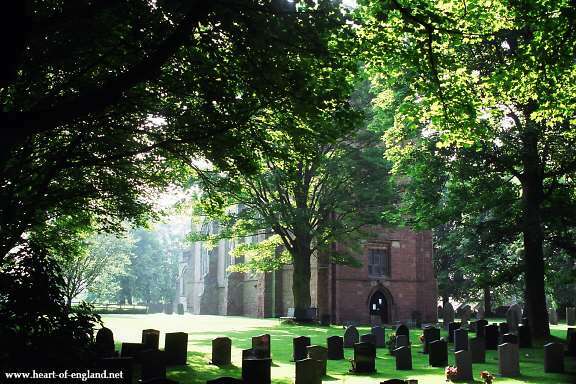 Astley Church is situated alongside Astley Castle, of which just ruins and a dry moat remain today. The castle was home to the Grey family. 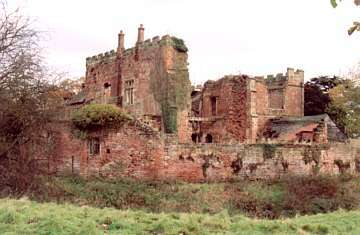 Three women who married kings or became queen lived at Astley Castle: Elizabeth Woodville, who became wife of Edward IV; Elizabeth of York, who married Henry VII; and Lady Jane Grey, the Nine-Days-Queen. The building was used as a hotel until 1978 when it was gutted by fire. Among many items of interest in Astley Church are (faded) paintings of the apostles and prophets on the wood panelling behind the pews (just visible in the photo), passages from scripture painted on the walls, and alibaster effigies of the Grey family. 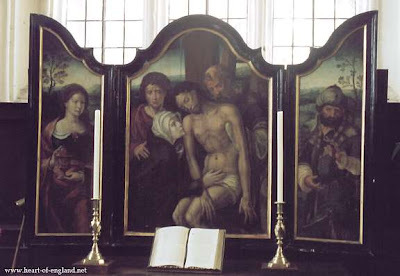 Despite its treasures, the feeling in this church is one of austerity. The plain glass windows contribute to the light and simplicity. Behind the altar is this triptych. This church is normally kept locked, but the sergeant lives in one the cottages near the church, and is very willing to open the building to any interested visitors. 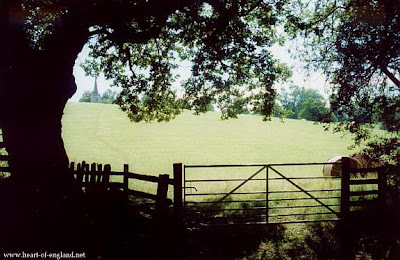 The church at the top of this hill is St Mary the Virgin, Lapworth. 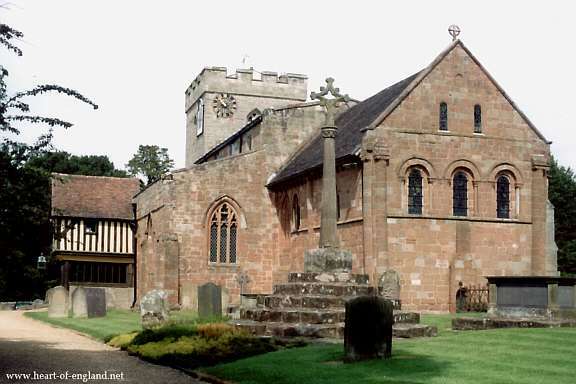 St Mary the Virgin, Lapworth. 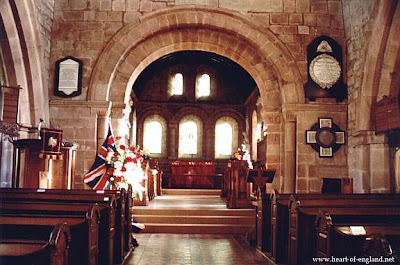 In Lapworth Church the stonework and polished wood are much in evidence, like Berkswell, but Lapworth has a much lighter feeling and less gravitas, perhaps befitting its dedication to St Mary. 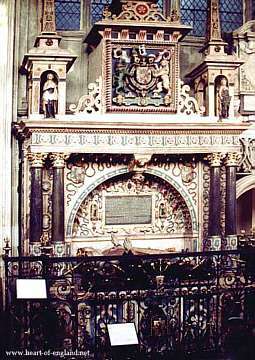 The table-top tomb beside the church porchway is the tomb of Robert Catesby, mastermind behind the Gunpowder Plot. 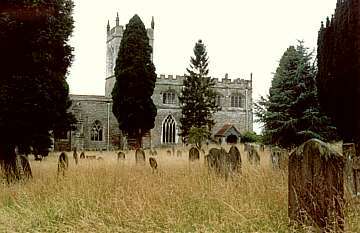 The churchyard of St Mary at Preston on Stour, 3 miles South of Stratford, is particularly atmospheric. The church is built on a hilltop. The path to the church, which appears to be level in this photo, actually rises quite steeply up the hillside. 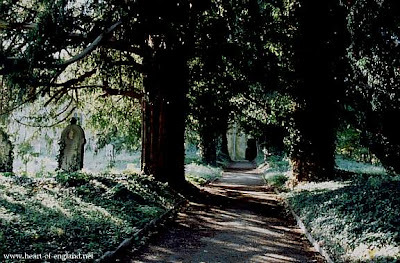 The path is bordered by an avenue of mature yew trees, several of their trunks wrapped in ivy. Ivy covers the borders at the side of the path, and parts of some of the tombstones. Heavy ancient tombstones, deeply encrusted with lichens, in the churchyard of St Mary at Preston on Stour. You can see how the hillside slopes steeply away down the side of the church. 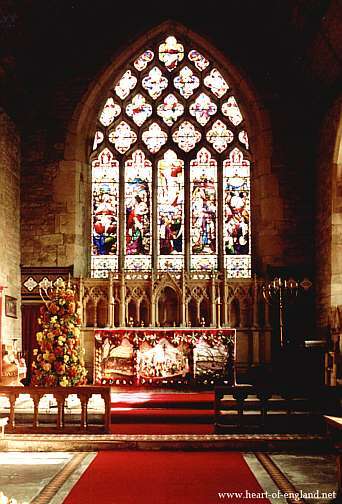 Inside the church of St Mary at Preston on Stour. 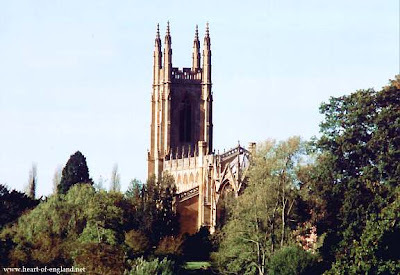 This is the church of St Leonard just outside the grounds of Charlecote Park. 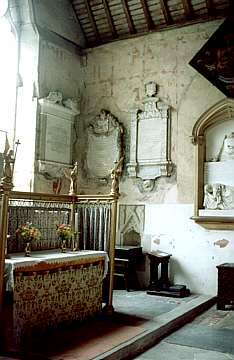 The Gothic style building houses the tombs of the Lucy family, owners of Charlecote Park. 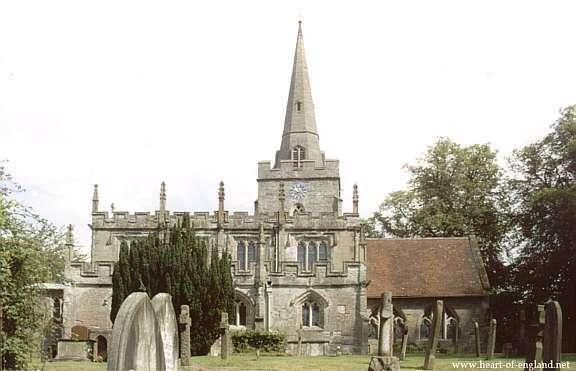 About a mile from Charlecote is the village of Hampton Lucy and the church of St Peter. This is the view of the church from the road from Charlecote as it enters Hampton Lucy. Hampton Lucy takes its name from the Lucy family. 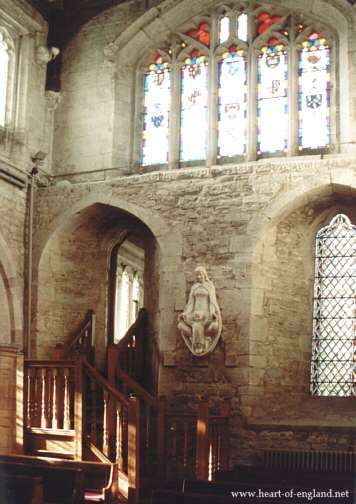 Sir Thomas Lucy was Lord of the Manor here. The present Gothic-style building dates from 1826 and replaces an older church on the same site. Some of the floor tiles still date from the 14th century. 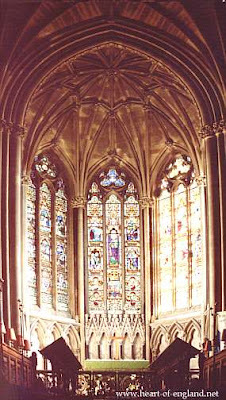 The East window, and the vaulted ceiling. 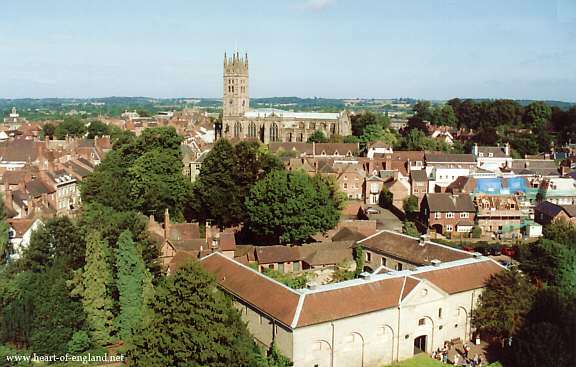 This is St Mary's, Warwick, as seen from the top of Guy's Tower at Warwick Castle. The square building in the foreground was the castle stables, and is now the castle visitors entrance, gift shop and restaurant. Beyond the church is the rolling Warwickshire countryside. 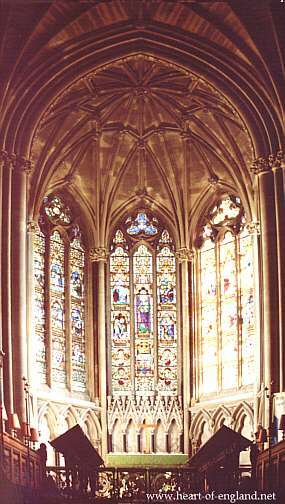 This is the nave of St Mary's, Warwick, looking from the chancel. This is a big building dominated by its massive columns. 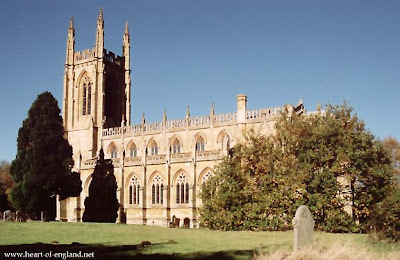 This church is both a parish church and a grandiose tomb for the Earls of Warwick. 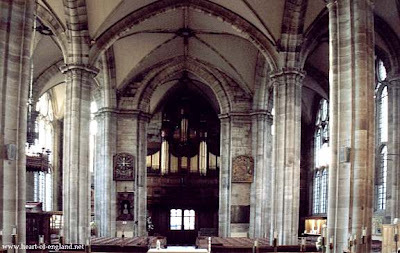 Simon Jenkins (see below) rates St Mary's, Warwick as one of 18 5-star churches in England. 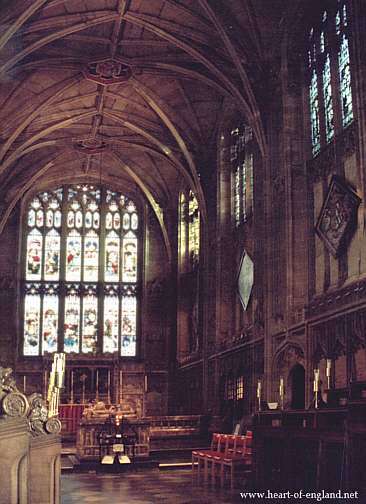 This is the chancel of St Mary's, Warwick, which is quite dark normally. Around the walls are large heraldic devices. You can just make out 2 of these under the side windows in this photo. Many incorporate swan images, part of the Beauchamp crest. 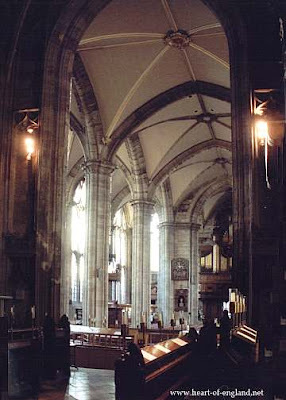 This is a view into the nave, looking out from the chancel, showing the arching columns and light coming in through windows on the South side. 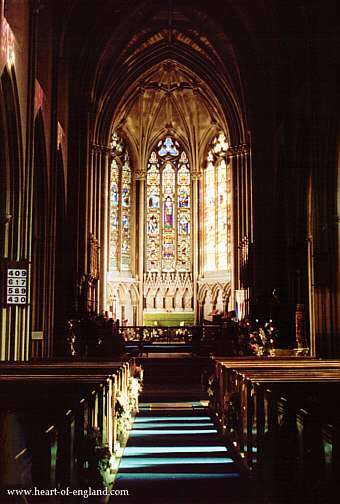 And this is the view from the far end of the chancel, near the altar. 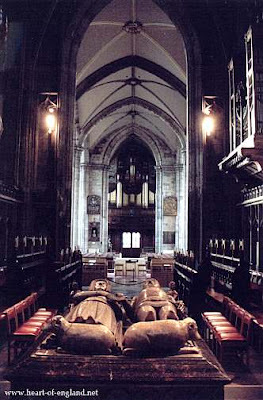 The two figures in the foreground cover the tomb of Thomas de Beauchamp (1329-1369). This is the crypt beneath St Mary's, Warwick. You can see some tombstones set into the floor. 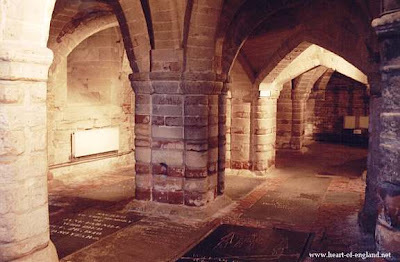 And there are further tombs in vaults just off the crypt. This is the Beauchamp Chapel in St Mary's, Warwick, a separate chapel just off the nave. 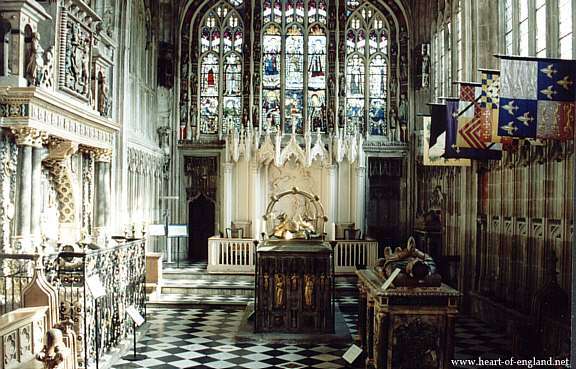 Originally built to house the tomb of Richard Beauchamp (1382-1439), whose tomb is in the centre. 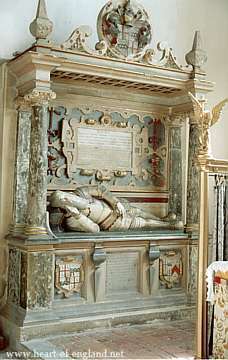 A century later the tomb of Robert Dudley (d1588), owner of Kenilworth Castle and favourite of Elizabeth I, was added to the wall on the left side of the Beauchamp Chapel, in a style even more elaborate than Richard's. These are the most lavish tombs that money could buy, for the wealthiest and most powerful men of the medieval and Elizabethan ages. 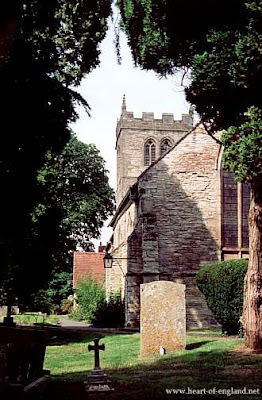 St Peter's Church, Wootton Wawen is the oldest church in Warwickshire. A Saxon church was founded here in the 700s. 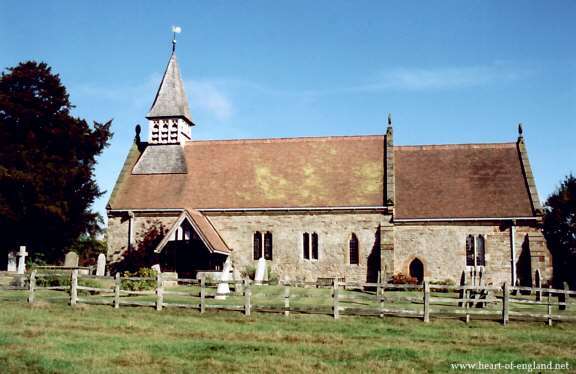 The first church was built of timber and thatch, and it was later rebuilt in stone. 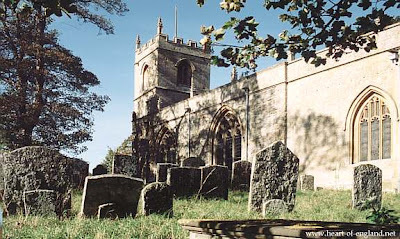 The parish church of St Mary the Virgin at Ilmimgton. The church has a fine Norman tower. There are no roads to this church. It can only be reached by footpaths between cottages. Inside, the church has a warm and lived-in feeling. The architecture is human and not dominating. There seemed to be little notices everywhere about various things, as though a lot of activity had been going on. And there were lots of bellringing magazines stacked in piles. 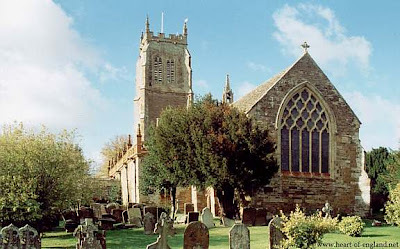 The church is proud of its bells and the Ilmington Ringers. You can see some of the ropes at the top of this photo. One of the treasures in the church is this Apple Map. 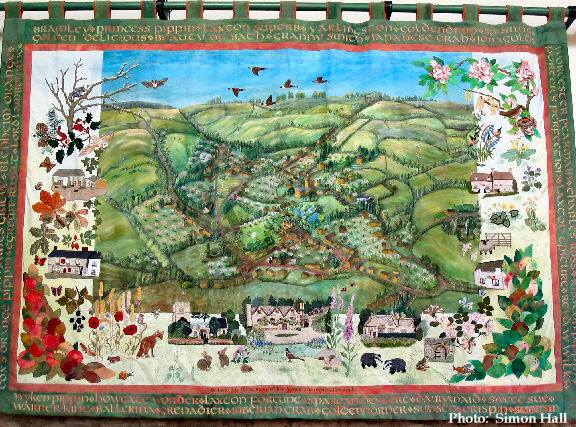 It's a needlework schematic picture of the village. The bright white areas on the photo are caused by direct sunlight shining on the map (I hope that won't cause those areas of the map to fade). 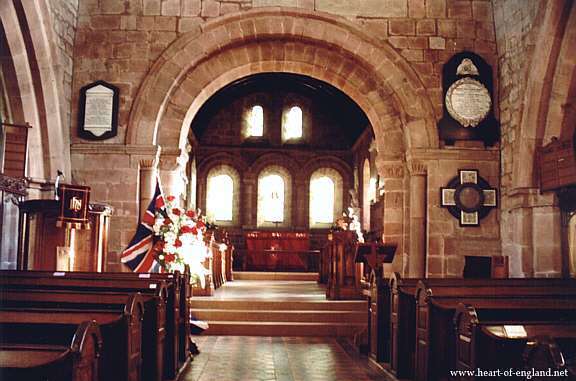 This is St Nicholas's Church, Loxley. This site has been a place of worship since the 8th century. 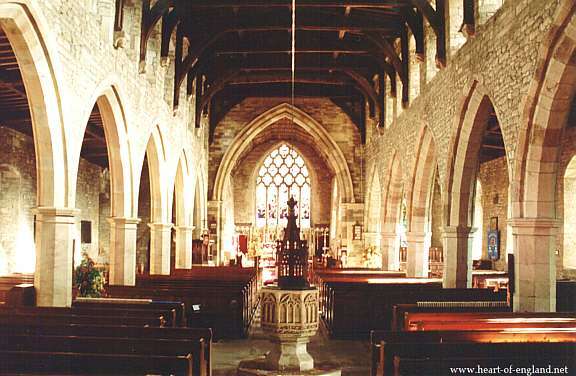 Some stonework in the church may be Saxon. 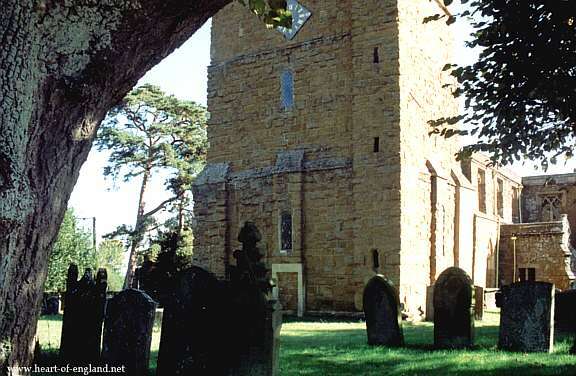 The tower is 13th century. 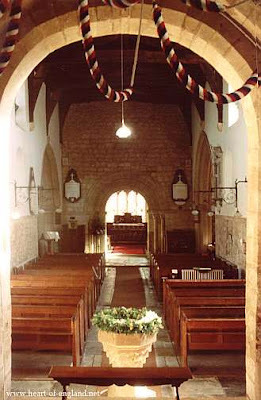 Loxley Church is normally closed to the public. 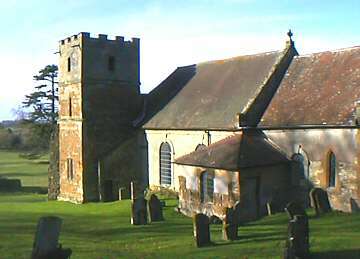 The village of Loxley is on top of a hill, just to the left of the church in the picture. Loxley was the birthplace and home of the original Robin Hood, Robin of Loxley. The Robin Hood legend as it comes down to us is the fusion of 3 separate stories. 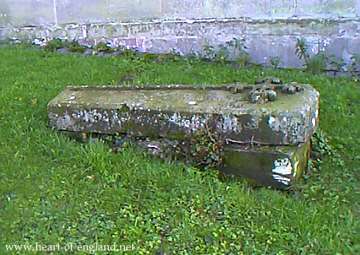 The book Robin Hood The Man Behind The Myth claims that the original Robin Hood was Robert Fitz Odo who was born in Loxley, lived here in Loxley Manor (next to the church), and whose gravestone, which bears an unusual and characteristic sword motif, lies in the churchyard of Loxley Church (shown at right). Many churches are situated on hilltops. This is the little Norman church of All Saints on top of the hill at Preston Bagot, just outside Henley-in-Arden. 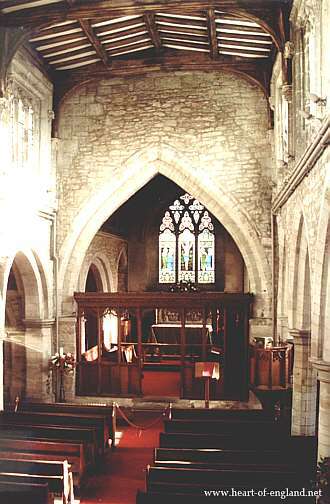 The view looking out from the church porchway is shown in the picture below. 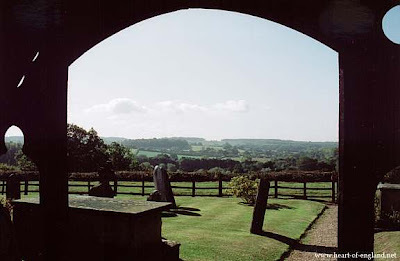 This is the view from the hilltop porchway of Preston Bagot Church looking in the direction of Wootton Wawen. Beyond the churchyard the view looks out across farmland and woods, the remnants of the Forest of Arden. There is increasing popular interest in these buildings, going beyond their original purpose and use as places of worship. Simon Jenkins (see just below) has argued for their importance as part of our national history and heritage. And they are increasingly visited by ramblers and tourists. 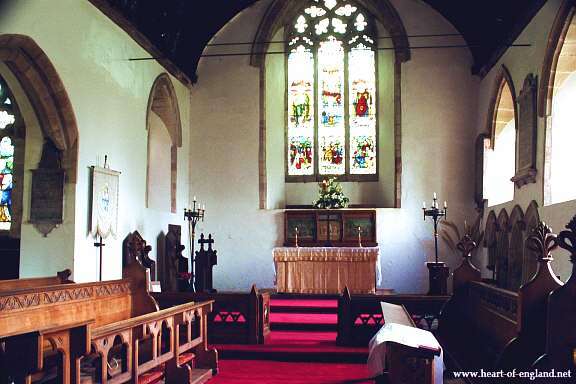 The definitive popular guide to English churches is Simon Jenkins' England's Thousand Best Churches. 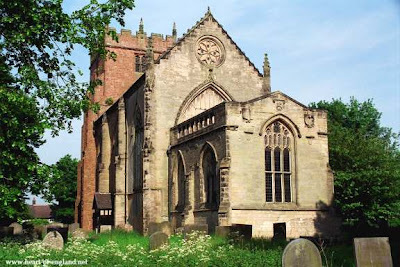 It includes descriptions of 15 churches in Warwickshire. Reviews of the book say that it is "lavishly illustrated". It's not! 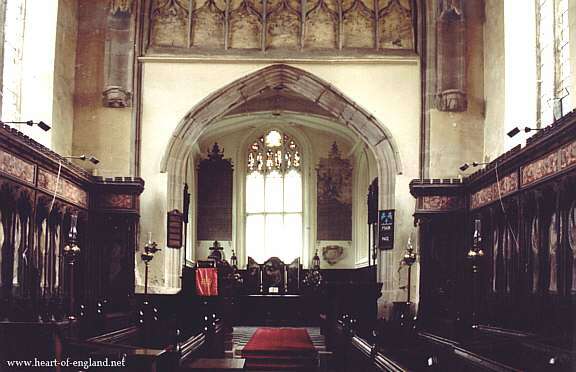 There are only 2 photos of churches in Warwickshire, both showing just some internal detail, and no external views. But the book still has a lot of information in it. Simon Jenkins maintains that England's churches are an important repository of the nation's history.